Last week while I was fulminating about the overpriced sloppy reproduction of a Reuben at Bergstein's NY Deli, all I could think about was the Reuben served at the Vienna Beef Factory Store, the cafe and retail operation at the foot of the venerable meat processor's sprawling plant near the perpetually constipated intersection of Damen, Elston, and Fullerton. Is it the Platonic ideal of a Reuben? No. Is it like the one at Dillman's, built on that sublime house-made rye? No. Is it even remotely like the skyscraper at Manny's (which often runs too dry)? Of course not. 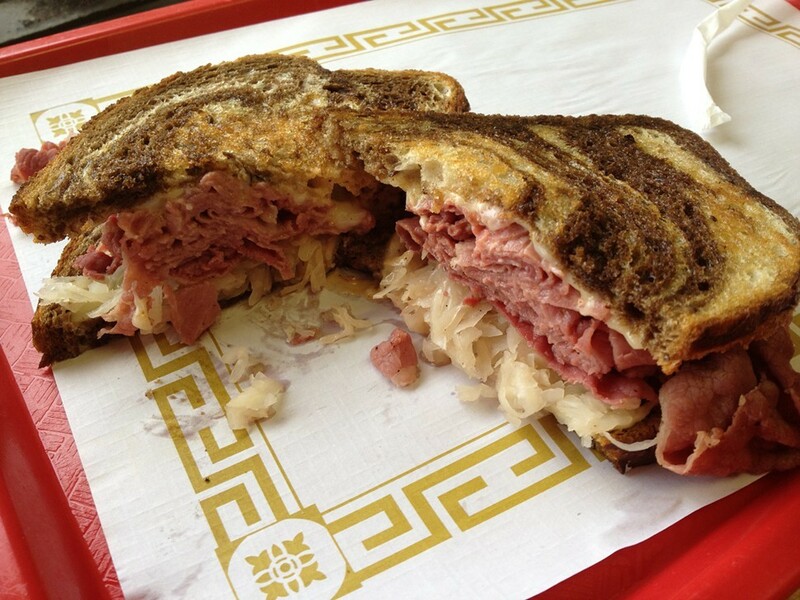 What it is: a value Reuben, constructed with Vienna's standard thinly sliced corned beef (probably the predominant choice for Reubens across the city), with a balanced strata of kraut, Swiss, and Thousand Island dressing, layered between slices of toasty marbled rye with enough surface area and solidity to keep each player in check. It's a well-behaved sandwich that keeps it together until it's eaten. Best of all it's a Reuben that won't insult your sense of thrift; at $6.99, it's 50 cents cheaper than the four-ounce finger sandwich at Bergstein's. Maybe you're worried that this dependable sandwich and all the other sandwiches and sausages served in the factory cafe will disappear to some inaccessible industrial lot in Bridgeport when Vienna relocates later this year. Don't fear. The cafe and store will remain open for two or three more years after the factory moves, according to staffers. They say that after that it's going to move somewhere else in the neighborhood. Hyde Park's deli does kreplach right. At least.